Art environments as presented in this weblog in general are related to the place of living of the maker, i.e. a house or a garden around the house. The art environment presented in the following post, created by an inhabitant of the city of Betanzos in the Galician area in the north of Spain, however manifests itself as a variety of artworks in kind of a park. Juan Garcia Naveira (1849-1933) was born in Betanzos. In 1870 he migrated to Argentine, where he made his fortune. Returned to Betanzos in 1893 he decided to use his fortune for the cultural and social improvement of the city and its inhabitants, doing so in cooperation with his brother, Jésus. One way was to allocate money for the establishment of social instutions like a sanatorium, a shelter for mentally handicapped girls and schools. The other way was the creation of a public leisure park with an educative background: El Pasatiempo. The park has a surface of about 90.000 m2. It would take Naveira some twenty years to accomplish the site. 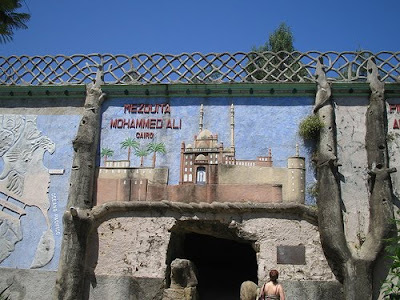 He himself was the autor intellectualis of the project, but he employed some 200 workmen to help with the layout of the park and the construction of the scenes and sculptors were commissioned to make sculptures and murals. Walking around in the park is like making a walk along highlights of history, as would be present in the collective consciousness of people living in the western world in the beginning of the 20th century (without radio, cinema, television or internet). The park indeed is a Parque Enciclopédico. 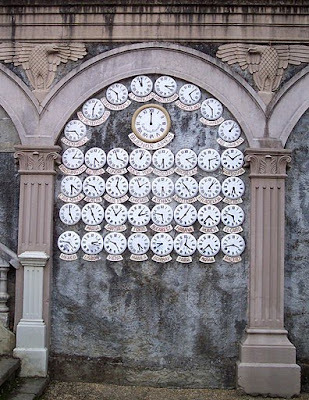 And there were many more scenes, like the Chinese Wall, a mosque in Cairo, sculptures of exotic animals, a botanic garden presenting crops from all continents, and also a rather well known item: the wall with clocks, showing the time in cities in the various time zones of the world. In the 1920's El Pasatiempo was a must see for travellers. After Naveira died and especially during the Spanish civil war and World War II the site became neglected and items were vandalised or stolen. For example, there was a gallery with statues of all popes of the Roman Catholic church, but this gallery has gone and nowadays it is a football field. The whole complex was declared to be a Bien de interés cultural in 1981. 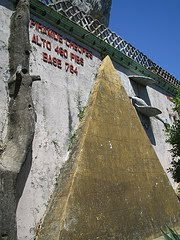 Currently it is owned and cared for by the city of Betanzos (since 1986). The city has done much to restore the park's former glory. * The site got a scholarly review in: Jo Farb Hernandez, Singular Spaces. From the Eccentric to the Extraordinary in Spanish Art Environments, Seatlle (Raw Vision, SPACES, San José State University), 2013. An abridged version of this article was published on the website of SPACES. * Google maps has a page with the location of the main features of the park. Sometimes you wonder why people such as this stay so cleverly hidden. Most commentaries on this creation are from a touristic point of view and almost all of them are written in spanish. Only recently some spanish architects and art historians have begun writing on these kind of sites in a more analytic way. Thanks for the comment and all the best during these last days of 2009. Cheers for 2010! I have just arrived to your site. looking for information about El pasatiempo. I have been recently reading and studying this amazing creation in Betanzos. Your post is well documented in general but I think it has an error in the picture which caption is ".....and a classical biblical scene of Mary, Joseph and their newborn son, fleeing for Herodos...". That sculpture of the photo does not belong to any biblical secene. 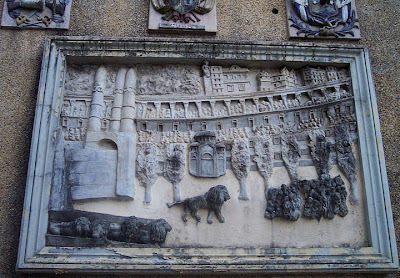 It is part of a group of sculptures that represent the travel of Juan Garcia Naveira and his family to Egypt. In fact it is almost a copy of one old photograph. Thanks a lot, Amio Cajander. I have corrected the inormation in my post. Could you send me a message on my e-mail adress? I would like to know more about the text published by "Academia Cajander", please.